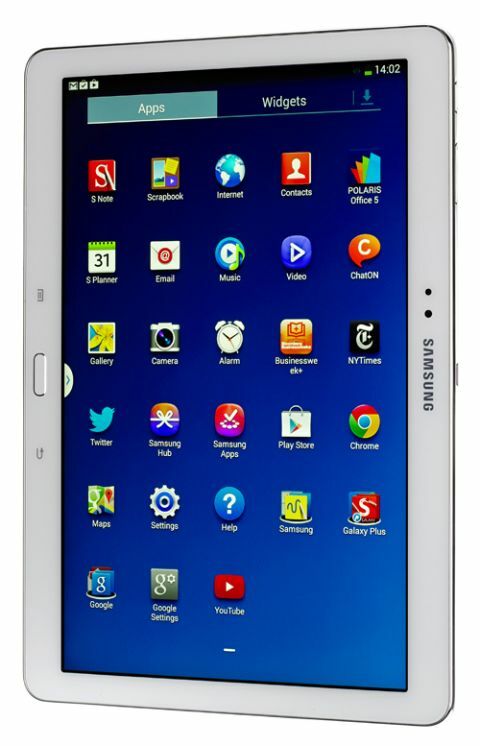 Samsung Galaxy Note 10.1 (2014) review | What Hi-Fi? The Samsung Galaxy Note 10.1 (2014 Edition) is much closer to the tablet we wanted the original to be, and finally looks like something that could have the iPad in its sights. For a start, it looks a lot nicer than the old model, having shaved off a centimetre from either side of the bezel, slimmed down to an iPad-bothering 7.9mm and dropped 60g in weight too. Samsung’s dedication to all that is plastic is unwavering though, and while we appreciate the benefits it can offer, we’re always going to prefer the premium feel of the iPad Air. Still, we have to applaud Samsung for trying. The plastic silver bezel-edging is now better executed and more understated, and the predecessor’s rather cheap-feeling glossy back panel has been swapped out for the leather-effect back seen on the Galaxy Note 3. It feels better to the touch, but it’s a look that’s still bound to divide opinion, particularly when it’s £50 more expensive than the iPad Air. What won’t divide opinion is the Note 10.1’s 10.1in screen. With a 2560 x 1600 resolution and a super-sharp 299 pixels per inch, it’s one of the best tablet screens on the market, doubling the resolution of its predecessor and even pipping the iPad Air for on-paper specs. Proof is, of course, in the viewing, and there’s certainly no doubt that the Note 10.1’s screen looks stunning. Icons and text are seriously sharp, while colours are bold and punchy, demonstrating the vivid colour palette we’ve come to expect from Samsung products. A bit like with a TV, there are a number of screen modes you can choose, including ‘dynamic’, ‘movie’ and ‘standard’. We find the standard option offers the best colour balance for our taste, but play around to see what works best for you. With this mode selected, we find colour in video to be more natural than we’ve seen on some previous Samsung tablets and smartphones, which have had a tendency to look oversaturated. We still prefer the iPad Air’s overall more neutral colour balance, but there’s no denying that the richer hues make for attractive viewing on the Note 10.1. Elsewhere in video, whites are impressively bright and punchy, though blacks could be deeper. Knock the brightness down a few notches and this does improve, though you will lose that zing from your whites as a trade off. As you’d expect from such a high-resolution screen, detail levels are superb, with outlines sharp and motion smooth. The iPad Air has a better way with fine detail though, giving a better sense of depth. The Note 10.1 features stereo speakers, placed at a good height that means they won’t get covered when the tablet is held in landscape or portrait. The sound produced is a mixed bag. The soundfield is immediately better and more immersive when compared with the mono speaker of the iPad, and the Note will go louder too. However the sound is thin and lacks any sense of warmth or friendliness, with very little bass weight and a treble that’s dangerously close to sounding harsh any time you boost the volume. The iPad Air sound, by contrast, is much more subtle and dynamic. Headphones are a better solution for movies and music. Then, in contrast to the disappointing musical performance of the S4, the Note 10.1 sounds pretty good. It’s not quite as punchy or sonically together as the iPad Air, but it’s rich and detailed, with decent timing and a good handle on dynamics for a portable device. It supports most popular formats too, including FLAC and WAV up to 192kHz/24bit. Performance is very quick indeed. Web pages and apps load swiftly (though we found some Samsung apps in particular to be unstable, with a few crashes during testing), menu swiping is smooth and fluid and multitasking is, on the whole, stutter-free. That’s hardly surprising considering the pure power behind the Note 10.1, which features the new eight-core Exynos 5 chip. This is basically two quad-core processors brought together – one with four 1.9Ghz Cortex A15 cores, and one with four lower-powered 1.3GHz Cortex A7 cores. The idea is that the lower-powered side of the processor can kick in for less power-intensive tasks, helping, among other things, to preserve battery life. There’s also a huge 3GB of RAM, and a choice of 16, 32 or 64GB storage options, with microSD card support to boot. The result of this combined is a smooth and enjoyable experience, though we have to say that Samsung’s TouchWiz Android skin is beginning to look dated and cluttered with the amount of Samsung bloatware that’s included. Now we know the uncomplicated joys of vanilla Android on the likes of the Nexus 5, why manufacturers continue with such a heavy-handed approach with their own skins and software is beyond us. One of the main advantages and selling points of the Note 10.1 over any other tablet, will be its stylus, the newly designed S Pen. Whether this will actually be of use to you will depend entirely on what you use your tablet for – heavy movie watchers may find less use for it than business users and arty types, who will undoubtedly find the note-taking and design apps handy. You are even able to turn the tablet’s keyboard off completely and use the tablet’s handwriting recognition should you prefer – and we found it to be pretty effective. It’s nice to use, and operates the tablet in exactly the same way as your finger would – even working with the capacitive touch buttons on the Note 10.1’s bezel.